From the Where the Wild Things Are department... Tech N9ne @ Austin Music Hall on Nov 4th! And man there's a bunch of artists... Krizz Kaliko, Kutt Calhoun, Big Scoob, Slaughterhouse, Stevie Stone, Glasses Malone, Dirty Wormz, and C.O.D. Aaron Dontez Yates (born November 8, 1971 in Kansas City, Missouri) better known by his stage name Tech N9ne is an American rapper. His musical career has spanned 24 years. Tech N9ne is known for his wide range of collaborations with other well-known artists. In 1999, Tech N9ne was included on the track (and accompanying video) "The Anthem" from Sway & King Tech, two radio personalities based in California. 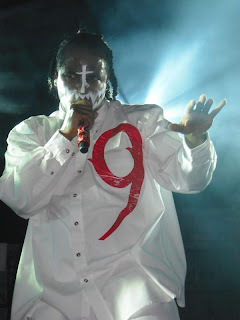 Early in his career, Tech N9ne was a member of a group called "NNUTT HOWZE", which he pays tribute to in many of his lyrics by saying "Six, six, triple eight, forty six, ninety nine, three" (6688846993), which spells out NNUTT HOWZE on the touch pad numbers of a telephone. However, the group disbanded when they were dropped from their label, Perspective Records. Additionally, he saw glimpses of success as a member of the 57th Street Rogue Dog Villians - also a Kansas City-based group - with their single "Let's Get Fucked Up".